Shop online for over 600 du-bro at discounts up to 90%. R/C Airplane Accessories is the most popular of the 6 du-bro categories, then Building Supplies, and Radio Accessories. 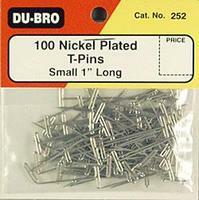 This is a Package of 100 Small 1" Long T-Pins from Du-Bro. 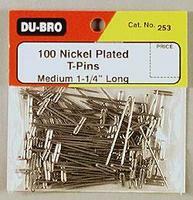 This is a Package of 100 Medium 1-1/4" Long T-Pins from Du-Bro. This is a Pair of Dubro 2-1/2" Micro Lite Wheels. This is Du-Bro's 1/8" Tubing Bender Tool. This is Du-Bro's 5/32" Tubing Bender Tool. 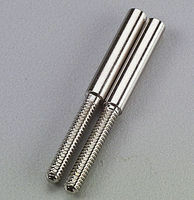 This is a Threaded Coupler for joining 4-40 size rods by Dubro. These are 3x8mm Socket Head Cap Screws. Dubro's Flex Cable is perfect for planes, boats, and cars. It is a braided metal cable inside a flexible nylon tube, mainly used for connecting the throttle or steerable nose gear to the servo. Fully adjustable, it won't stretch or shrink with changing weather conditions. Threaded coupler, and solder link inlcuded. 1/16 Diameter. 1 per pack. These are Steel Landing Gear Straps. This is a 90° Nylon Bellcrank Assembly. This is a pair of 3" Diameter Micro Sport Wheels from Du-Bro. This is a package of DUBRO wheel collars generally used to secure the wheels on the axles on an airplane but can be used for other applications as well. There's no need to use a hammer, with Dubro's easy on/easy off spinners. Just press-fit the nylon lock nuts to the backplate, align the nose cone core to the backplate with the four included pins, and secure the nosecone with the included socket head screws. Fast, easy and effective. Each cone comes complete with the mounting hardware and four shaft adapters. * This is a STANDARD spinner NOT a Kwik-Lock spinner. These are Super Strong Large Scale T-Style Nylon Control Horns. These are 2-56 Hex Nuts from Du-Bro. 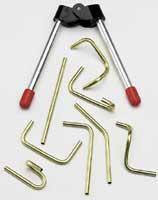 These are Standard Nylon Hinges. Bulk replacement EZ Connectors by DuBro. 12-EZ Connectors (brass) 12-Retainers (snap onto the bottom of the EZ Connector) 12-Washers (gray metal) 12-Socket Head Screws (help hold the pushrod wire in place).